GALA Choruses, Inc. offers our members networking opportunities and Discussion Groups, an annual Leadership Symposium, a full array of administrative support, and a sizable Online Resource Library, in addition to our signature event: the quadrennial GLBTQ Music Festival! 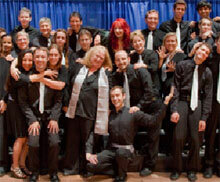 GALA Choruses is open to all GLBT and GLBT-allied choruses. Learn more about membership or sign up today to join us in changing the world through song. View a video of Born This Way - by the Global Queer Quire - Changing Our World Through Song! Our member choruses have access to valuable resources, collaboration groups, and much more. Find out what membership in GALA Choruses can provide you and your group. Check out the valuable tips, tools, and programs available within our vast Resource Center.